Main attractions Social-media-savvy versions of brunch staples, presented in a sunny space channelling the past. 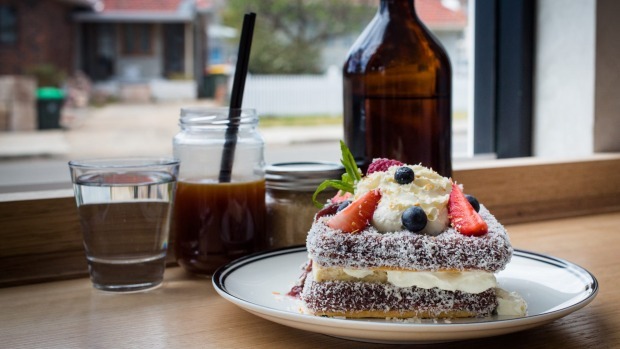 Must-try The lamington waffles, which are descended from the hotcakes at sister cafe Left of Field. Insta-worthy dish The lamington waffles, of course. We saw one guy go it alone, but we recommend sharing – it is pretty hefty! Coffee Single O "Paradox" for milk-based coffee, $3.80; Single O "Kenya Starfruit" for filter coffee, $5. Tea Tea Leaves Australia, $4. Prices From $8 for a kid's breakfast (eggs and bacon on toast) to $19 for a ploughman's lunch. Open Tues-Fri 7am-4pm; Sat-Sun 8am-4pm. You will learn about Paperboy's history before you walk through the door. Above the entrance, in neat paint strokes, is a sign commemorating "M & G Abdallah": the couple who built this site in Concord, about 60 years ago, when the suburb had an entirely different character. "The area was all industrial: paint factories, gasworks, no apartments," says Matthew Abi-Arrage, who runs the cafe now in this location. One of the bearers of the building's initials is still alive, though – and she's Paperboy's landlord. Only 18 when the original construction was complete, she initially ran the space as a takeaway sandwich store. It was literally an extension of her house – which is apt, as Paperboy retains a sense of neighbourly intimacy decades later. Abi-Arrage co-owns the cafe with Clovice Khachan (the pair also run Left of Field in Rhodes) and with Paperboy, they wanted to conjure a sense of nostalgia, familiarity and old-school reliability. Hence the name: "we were just playing on 'who is that local character [who would] know everyone's names?' "It's rare to see kids dragging newspapers along their delivery route these days, as the black-and-white photographs in the bathroom remind you: one even shows a paper-shilling boy smoking a cigarette on the job. The menu at Paperboy is very 2017, though. 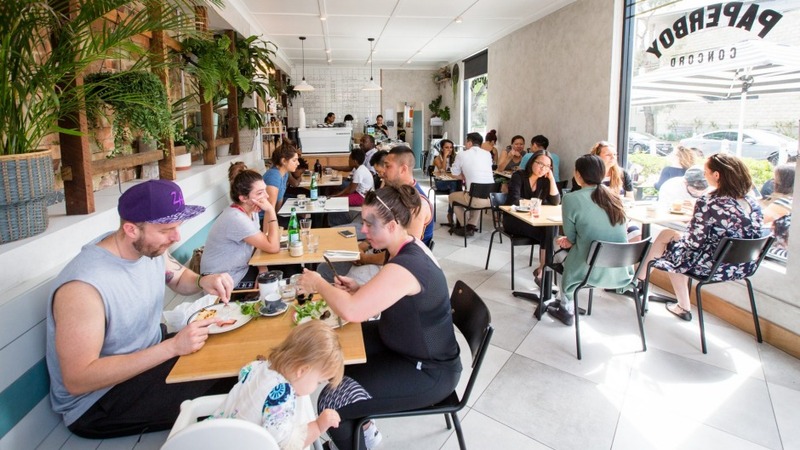 The cafe, which opened three months ago, features Instagram-pretty dishes that cater for health kicks (coconut and chia maple porridge) as well as indulgent blowouts (lamington waffles). It explains why the crowd is pretty eclectic – from young families to sporty bros and girlfriends catching up. 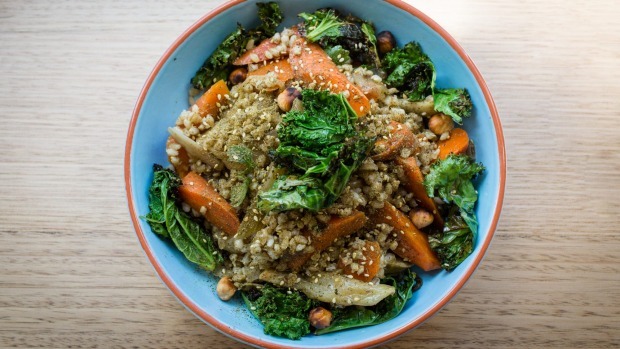 The roasted carrot and kale salad isn't necessarily good-looking, either, but the featured vegetables traffic in an appealing caramel sweetness (the do-gooder greens are given a particularly great char and crunch), which works with the understated pearl barley grains. Plus, the hazelnut dressing, sprinkling of zaatar and extra handful of roasted nuts make it a salad worth befriending. And, like the coconut and chia maple porridge that's dusted with pistachio crumb and served with warm poached pear, it gets bonus points for being vegan. Adding to the feel-good bent is the coffee, with the filter option (Single Origin's Kenya Starfruit) served on a wooden board with a palate-cleansing glass of sparkling water. Alongside the coffee is a note explaining how its bright, fruity flavours are courtesy of three villages in Nyeri, south-central Kenya, where 1100 farmers harvest from 250 trees. The farmers are given advances so they can pay school fees before their crop is ready. Funnily enough, Abi-Arrage hasn't yet tried this single origin ("I'm actually doing this F45 eight-week cycle, so I can't, I'm off coffee!") but health-minded diners skipping the caffeine also have other options, such as the Nectar cold-pressed juices, with summery combinations such as Sweet Cheeks (watermelon shot through with raspberry, apple, cucumber and a squeeze of lime) or the Splice-like Tropic Cool (pineapple blitzed with apple, mint, lemon and orange). Less virtuous – but definitely satisfying – are the lamington waffles. The buttermilk batter is grilled, then dipped in dark chocolate and desiccated coconut. The waffle halves are sealed with an oozy mortar of coconut parfait and topped with double cream and house-made berry jam. It's dishes like this that explain the all-ages appeal of Paperboy. But you don't have to read all about it. You'll inevitably see the lamington waffles surface on your Instagram feed, trailed by an enthusiastic collection of well-deserved "likes". This volunteer-run museum showcases the area's achievements, quirks and history, with some material dating to the 1800s – including the Underwear through the Ages section. Exhibits range from a 1930s kitchen display to the history of the Mowhall – originally used to cut grass at the local speedboat club – this became the model for the classic Victa lawnmower. The memorial rose garden marks the start of this walk, which is a tribute to the Australian veterans and locals who served during the World War II campaign in Papua. There are 22 stations along this 800-metre walk, which spans from Rhodes Station to Concord Hospital, and illustrates key details about the battles fought in 1942. 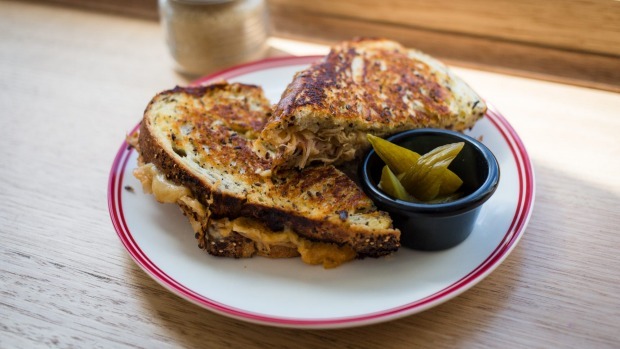 If pavlova hotcakes, breakfast burgers and Nutella pretzel shakes weren't already strong selling points, this cafe's location in Burwood Park definitely gives it an extra advantage over its competition. The kid-friendly menu items (such as bear-shaped toast) are a well-suited match for the playful surrounds. It has earned a loyal following for its extensive range of dumplings and for being accommodating to the indecisive – you can get two choices on one plate (say, pork with eggplant and lamb with coriander; or ditch the meat and try the vegan varieties), or if you're really hungry, you can order an assortment of 20. This eatery made a colourful splash with its 24-layered rainbow mille crepe cake when it opened this year, but that's not the only pastry attracting attention. There's also a tiramisu version of the crepe cake, caffeinated with coffee from the Grounds, as well as matcha macarons and fruit danishes.